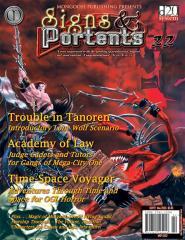 #22 "Trouble in Tanoren, Academy of Law, Time-Space Voyager"
Time-Space Voyager – Quirkily good timing, you might think, to have a campaign setting for OGL Horror based on a time-traveling hero. Pure chance, I tell you. The Monks of Dim-Mak – Regular contributor Mark Charke looks at fighting monks in d20 fantasy and postulates that there’s more to the spiritual life than kung fu and calling everybody ‘grasshopper’. The Academy of Law – Fighting judges in Gangs of Mega-City One can be a daunting experience for even a well tooled-up gang, but it can be jolly good fun picking on a rookie cadet undergoing training. Go on, bully the Law. You know you want to. The Magic of Midgard – The second part of our epic Slaine article introduces a new system of runic magic that nicely fits the bleak northern wastes of Tir Nan Og. The Vagabond – Matt Thomason details a new supporting character for Lone Wolf, a chap who you’ll probably want to keep a sharp eye on in case he takes a liking to your valuables! The Flying Squad – No, not Regan and Carter, but judges taking to the sky! Sometimes it’s just faster to go by air, and there are times when even Judge Dredd needs to get some rapid aerial assistance. Red Nails – Vincent Darlage details the enigmatic inhabitants of the mysterious deserted city of Xuchotl for Conan the Roleplaying Game. Become involved in an endless feud, only to be remembered as a red nail hammered into a totem pole. Either that or leg it with the rest of your party and head for the dubious delights of Shadizar – not that we’d ever condone debauchery, of course!